The 12 Apostles are a collection of offshore sea stacks between Princetown and Port Campbell on Victoria's Great Ocean Road. 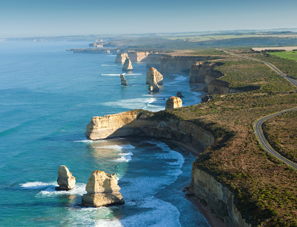 The main viewing area is on the corner of Booringa Road and Great Ocean Road Princetown 3269 and is 6km west of the small township of Princetown and 12km east of Port Campbell. It is the sheer scale of the offshore stacks that are most breathtaking at this point. Nothing will prepare you for the grandeur of this iconic site in the flesh. Dusk and dawn provide the best viewing and photographic opportunities. Visitors may also be able to view penguins from the cliff top viewing area, but this only happens about 15 - 20 minutes after sunset.